One of the common complaints I get in innovation workshops is as follows – We get many ideas but we don’t get time in our busy schedule to work on them. What can I do? Many times the participants look at me to provide some sort of solution based on my experience. My favourite response is to turn the problem on its head by using the “bright spots” approach and generate options from the participants themselves. It has always generated useful ideas. Here is how. Some of these situations are not scalable. 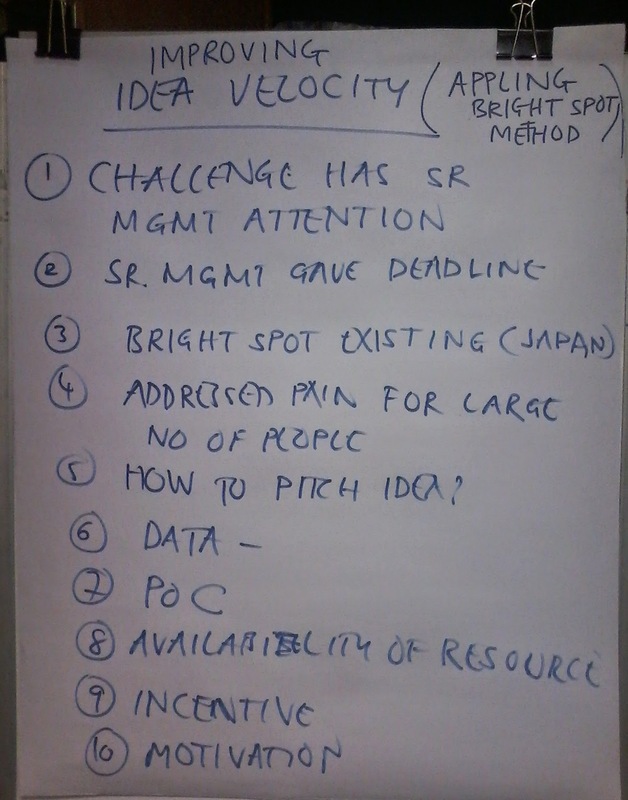 For example, #1 says, “Challenge has senior management attention”. You don’t have control on whether a particular challenge will get senior management attention. However, some others are scalable. For example, one can pick up a challenge that addresses a pain area for a large number of people in your team (#4). In a team, everybody was spending a lot of time in populating a dashboard which was possible to be generated automatically. When someone proposed a solution to automate the process, everybody backed him up. And the idea got implemented within a month. Similarly, an idea that got push back from manager moved forward when the engineer created a Proof of concept and showed him (#7). Not everybody finds bright spots approach appealing. However, a few people are always surprised. It is a sudden discovery that a key to the problem they want to solve may be already there in their trouser pocket. At the end of the workshop, I ask for one take-away from each participant. Not surprisingly, “Bright spot” approach comes up as a take-away from at least 3-4 people. Think about how you might apply bright spot approach to your nagging problem.